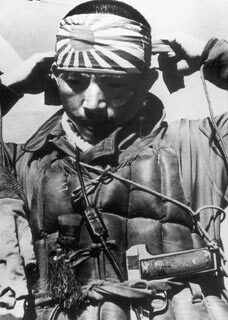 A Japanese pilot about to demonstrate the utility of Corbynite electoral strategy against the USN and Royal Navy off the coast of Okinawa in 1945. One of the reasons I post to this blog is to illustrate the historical parallels which confirm Marx’s axiom that history repeats itself; first as tragedy, then as farce. And then, I would add, as cliche. I’ve resisted posting much on Cobyn’s success in the Labour election because it remained unclear whether it would represent the triumph of what Norman Geras memorably titled the Verkrappt Left, or whether the reality of power-broking in a wider party political context would dilute the ideological purity of the Corbynites. To some extent this uncertainty was mirrored by Labour MP’s in the Parliamentary Labour Party (PLP) looking for signs that the Corbynites would reach back into the Bennite past to impose a policy of local re-selection of MP’s, handily allowing the hard left to seize control of the reselection process and thereby purge centrist Blairite ‘wreckers’ and ‘saboteurs’. But does Corbyn even need to do this? This sort of purging would only be necessary if the PLP had the potential to form a anti-Corbynite consituency and engage in a struggle for power. My opinion is that it lacks even this capacity. The evidence of the post-Blair Labour record, first under Brown and then under Milliband, reveals the complete absence of any depth of a genuine Blairite constituency in the PLP. The pathetic support shown for Liz Kendall’s bid for Labour leadership, and the comically impotent responses of the PLP to the chaotic fiasco of Corbyn’s leadership so far, indicate that the absence of a centrist constituency in the PLP has become so pronounced that I doubt that the PLP would be able to challenge Corbyn even if it wanted to. It’s apparent that many in the PLP are aware of the problem, but the point is that none have had the will to do anything about it. Reselection would be an imperative if the PLP was to represent a threat to Corbyn. The evidence to date is overwhelming that it does not. Even if it did, there is no wider appetite for a public stand on discredited Blairite centrism. Which means that the conditions necessary to challenge Corbynism are absent, and will need to be created anew. It was my fond hope that electoral defeat in 2015 would have been sufficient to point out the error in abandoning Blairite strategy, but this is clearly not the case. Blairism remains discredited in a wider sense within and without the Labour party itself. Repeated electoral defeat is the only measure which will demonstrate the gap between what the hard left want, and the unarticulated but nonetheless distinct reality of what the British electorate will accept. 2015 was not enough to instil the lesson, and therefore an overwhelmingly catastrophic electoral defeat of the hard left is required in 2020. The necessary pre-condition of that is the construction of Corbyn’s platform as an exemplary and uncompromising example of hard-left policies untained with any remaining traces of centrist deviationism. It will not only need to be an eye-wateringly uncompromisingly leftist platform designed to demonstrate the obsolescence of any residual appeal to the centre, it will need to be widely advertised as such. Fortunately Corbyn has landed upon the perfect agent to deliver this in the form of Seamus Milne, the Stalinist ex-editor of the Guardian’s ‘Comment is Free’. It would be difficult to pick a better choice. I won’t rehearse Milne’s full credentials here; suffice it to say that he’s long been an apologist for fascist terrorist groups such as Hamas, Hezbollah and the Iraqi ‘resistance’. His reflexive anti-Americanism has been a determining influence on his commentary over the past decade, most notably expressed in his attribution of blame for the 9/11 attacks on America itself and his characterisation of Putin’s invasion of Crimea and his military adventures in Ukraine as ‘defensive’. Milne, like most ideologues and especially communist ideologues, likes to see himself on the right side of history. Enraged by Francis Fukuyama’s assertion in the ‘End of History’ that the evident success of liberal democracy and the evident failure of Soviet communism at the end of the Cold War amounted to an end to history, Milne postulates (most obviously in his own book, ‘The Revenge of History’), that the following decade has seen the defeat of the American neo-liberalism Fukuyama saw as decisively victorious in the battle of ideologies. The problem with Milne’s appropriation of historical teleology (and Fukuyama’s similar effort to interpret the past exclusively in the light of a pre-determined analytical conclusion) is that history does not work for the deterministic benefit of political ideologies, even if it is sometimes influenced by them. To return to an illustration of the historical phenomenon of the repeated collisions between the ideological purity of Milne/Corbynism and electoral reality, I am gratified to find another excuse to quote Denis Healey after his recent death. Healey was the nemesis of the Labour ideologues when they thought the arrival of the Millenium was about to be assured by the purging of centrist deviationists and wreckers like Healey from positions of power and influence in the Labour Party. This process was exemplified by the 1981 battle for the Labour Deputy Leadership between Healey and Tony Benn. This is the template that Corbyn’s ‘new politics’ will have to avoid. Given Corbyn’s prominence as an IRA/Hamas/Hebzollah/anti-American apologist, the attitudes of his shadow chancellor (deliberately and distinctively pro-IRA in the past) and Milne’s similar track record, my money is on it failing to do so. After all, as Healey points out, the 1981 controversies were just another repetition of the same conflict which had riven Labour in the 1950s. Which means that if there is any teleology involved in all this, it points towards a further and entirely predictable Labour defeat in 2020. First tragedy, then farce. Then cliche. To further illustrate the move from tragedy to cliche and then back to farce involved, I only need to quote Tom Sharpe’s satire ‘The Wilt Alternative’. Tempting as it is to compare Milne to the left-wing terrorists Sharpe parodies (with their arch-Corbynite allegations against ‘CIA Zionist reformists’), the most accurate parallel arises when the protagonist feels compelled to defend a hard-left academic colleague from the hostile reaction to his film on Marxist-Leninist Crocodile Buggerism. Yes, Marxist-Leninist Crocodile Buggerism. Which is why I unreservedly greet Milne’s cheerleading of Labour policy under the Corbynites as the natural and necessary precondition for what I have earlier described as Labour’s Kamikaze joyride to electoral oblivion. I do remember reading ‘The Wilt Alternative’. The crocodile-buggerism analogy is a good one, but the only problem is that (as was the case with a lot of Sharpe’s writing) there’s a lot of context to fill in.